ELCAN Specter® DR. © Raytheon ELCAN. 2016 is the 10th Anniversary of the introduction of the ELCAN Specter® DR weapon sight to the USSOCOM SOPMOD Kit Block 2. Raytheon ELCAN will be marking this milestone at events across the globe starting at SHOT Show in Las Vegas in January. 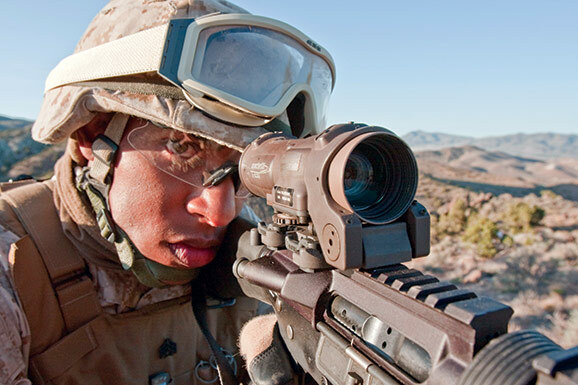 In 2003, Raytheon ELCAN identified the requirement for a single sight that would improve the warfighter’s speed of engagement, target identification and lethality when confronting threats at distance and at close range in order to dominate in the urban combat environment. Incorporating the voice of the customer, Raytheon ELCAN designed and developed the ELCAN Specter® DR 1-4x rifle sight - the world’s only truly dual-field-of-view optical weapon sight providing both close quarter and precision fire ranged capability in a single sight. The two unique fields-of-view (1x and 4x) are easily and quickly interchanged by means of the patented, locking lever mechanism on the side of the optical housing. According to Dan Pettry, Product Manager, Rifle Sights for Raytheon ELCAN Optical Technologies, “The ELCAN Specter® dual role weapon sight is still the only combat sight that is specially designed for both close combat and precision shooting without the introduction of another optic to the system (ie. 3x magnifier or mini red dot). “As a former member USSOCOM, I relate to the persistent challenge to select the ideal optic for that day’s mission. The landscape in which missions take place not only changes from day to day, but often several times during a single operation. This makes the choice between a reflex sight and a magnified sight even more difficult. Raytheon ELCAN continues to develop the dual role optical weapon sight line in order to meet evolving operational requirements. The ELCAN Specter® DR 1-4x dual role weapon sight was originally designed for the M4 carbine. However, with the introduction of the SCAR-H to Special Operations Forces, the ELCAN Specter® DR dual role weapon sight in both 1-4x and 1.5-6x magnifications has proven to be a strategic addition for this rifle as well. This is, in part, due particularly to the SCAR’s very high shock profile. 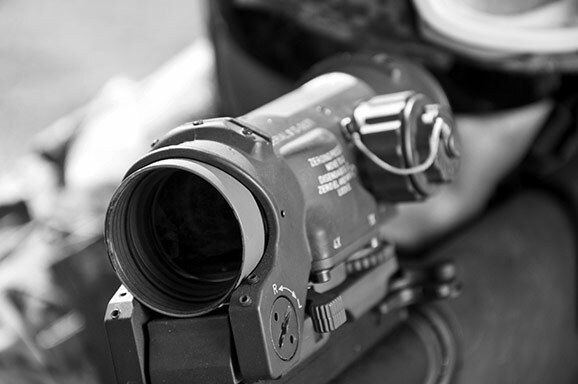 An ultra-rugged sight such as the ELCAN Specter® DR dual role weapon sight was necessary to perform on this weapon system. In recent years, the ELCAN Specter® DR dual role weapon sight in both 1-4x and 1.5-6x magnifications have become popular and effective optics for light machines such as the M249 and M240 as well due to the versatility in both urban and open environments and its ruggedness. Internationally, the ELCAN Specter® DR dual role weapon sight is used on several other weapon systems such as the SA-80 and the ARX-160. Over 600,000 ELCAN Specter® sights have been deployed with Allied forces around the world including various US forces and agencies, United Kingdom, Italy, Norway, Canada (ELCAN Specter® OS 3.4x C79 in service since 1986), Australia, Peru, Chile, Mexico and Saudi Arabia. This is not an exhaustive list. Beyond meeting operational requirements, the success of the ELCAN Specter® brand is due to the focus of the ELCAN design team on the “Big Five” optical parameters: magnification, objective size, exit pupil, eye relief and field-of-view. ELCAN Specter® sights are founded on the high precision, high quality optics that ELCAN is renowned for worldwide.